Finger painting was one of my favorite pasttimes as a child, and I looked forward to the days at school when I could squish my fingers into gooey colors. Now, eco-minded parents concerned about their children’s health can chose eco-friendly fingerpaints made by Livos, a long time trusted company in my family for oils and varnishes. All natural and sensory fun, what could be better? Salis Fingerpaints come in six colors: yellow, red, black, green, blue, and white. 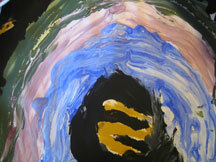 These paints can be mixed to form more colors giving children hands-on experience with color theory. They can also be diluted with water to be applied with a paintbrush, if your child is the type that doesn’t like to get his/her fingers dirty. Salis Fingerpaints can be used on stone, wood, unglazed clay, paper, cardboard, salt dough, etc. These chemical-free hemp-based paints are made without heavy metals, VOCs, or other harmful ingredients, and derive their colors from vegetable dyes or all-natural mineral pigments. They are the only recommendable fingerpaint under the Swiss Consumer Association, No. 177, 10/90, and correspond to the German Voluntary Agreement upon Fingerpaints. Standard food preservatives are not suitable for the finger paints because of the low activity in the paints, and many standard cosmetic preservatives are known allergens (e.g. pHB-esters or isothiazolinones). In Germany, Benzalkonium Chloride is used in eye-drops and is permitted for the use even on mucuos membranes. LIVOS has chosen this preservative because the available evidence shows it to be the best and most harmless option. My daughter was so excited to have natural fingerpaints, she immediately created this rainbow, in addition to a treasure map. There’s something about using your fingers that gets the creative juices flowing in young children. You can read more about the toxicity of art supplies and alternatives at our sister blog Crafting a Green World. Oh, here a link where I got them! Natural beauty: Rose & Chamomile EO bath, shower, bubbles! Who Owns Your Favorite Organic Brand?